+ Michael McCann, Ph.D., C.I.H. Solvents can be defined as liquids that dissolve other materials or are used to make evenly dispersed mixtures. Water is an extremely common solvent. The advantages of using water as a solvent include the facts that it is inexpensive, easy to dispose of, and nontoxic. Soap and water solutions can be used for many cleanup jobs. If one wants to clean, dissolve, or thin materials that are not soluble in water, organic solvents must usually be used. These types of solvents can dissolve grease, dirt, resins, oils, varnish and other materials; they are used to thin paints, varnishes, and lacquers; to clean pieces of art, tools, brushes, work surfaces, and even, unfortunately, hands. Frequently used solvents include kerosene, acetone, turpentine, toluene, ethyl alcohol, etc. Mixtures of solvents are also common, for example lacquer thinners, mineral spirits, naphthas, and petroleum distillates. Solvents are ubiquitous in our lives. They thin oil paints, and are found in some drawing and printing inks, wood preparation and finishes, photography and plastics materials.metal cleaners, and some adhesives. 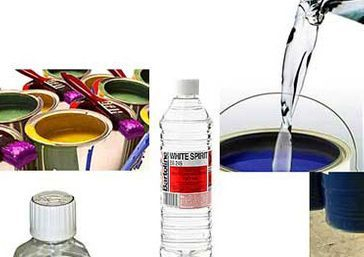 Most commercial art products contain solvents. Those who work in the performing arts use solvents are in prop, scene and set fabrication, dressing, and cleanup. Solvents are found in hair sprays and costume products, fabric finishes, and some theatrical fogs. Ballet dancers spray pointe shoes with solvent products, and musicians clean instruments with solvent-based cleaners. Composition of Solvents Solvents can have unique chemical structures or can be mixtures of chemicals. For example, acetone is a unique chemical, whereas mineral spirits is a mixture of several solvents in the same boiling range. Each chemical is assigned a Chemical Abstract Number (CAS #) which identifies it. In some instances CAS Numbers are also assigned to well known mixtures like mineral spirits. Solvents can come in different grades of purity, and can sometimes be contaminated with small amounts of other solvents in the manufacturing process. If purity is of concern, then it is important to get your solvents from a source that will give detailed information on contents. The names of solvents can also vary. For example, methyl alcohol and methanol are chemical names for one solvent, and 1,1,1-trichloroethane and methyl chloroform are chemical names for another solvent. Solvents can also have other synonyms, for example wood alcohol is a synonym for methyl alcohol. Hawley's Condensed Chemical Dictionary and the NIOSH Registry of Toxic Effects of Chemical Substances (RTECS), are good sources of information on synonyms. Unfortunately, a solvent or solvent mixture can also be sold by a product name or trade name which gives no information about its composition. Lacquer thinners from different manufacturers, for example, can have entirely different compositions. Similarly, trade names such as Varsol do not give information about the composition. The Material Safety Data Sheet for such products should list the hazardous ingredients in the trade name product. Another problem with trade name products is that their composition can change without warning since manufacturers often change the composition of their solvent formulations based on the availability and price of the various components. Therefore, these materials may then produce variable results and have an unknown toxicity. Solvents can vary widely in their volatility, with low boiling point solvents being much more volatile. This means that large amounts can evaporate into the air in short periods of time. The accumulation of solvent vapors in the workspace air can become both a health and a fire risk. The volatility of a solvent is best indicated by its vapor pressure (vp), the pressure that the vapors, generated by evaporation of the liquid, exert upon the atmosphere above the liquid. The higher the vapor pressure, the more volatile the liquid, and the more easily it evaporates at room temperatures. For example, acetone, which has a vapor pressure of 150 mm of mercury at room temperature and standard atmospheric pressure, evaporates quicker than methyl ethyl ketone with a vapor pressure of 71 mm. The volatility of solvents increases when their temperature is increased. Solvents should be heated only with caution and contact with hot surfaces and ignition sources must be prevented. Knowing the exact chemical ingredients of the solvents and other materials that you work with will enable you to determine their toxicity. If the ingredient information is not adequately provided on the label, one can request a Material Safety Data Sheet (MSDS) from the manufacturer or distributor of the solvent. A general indication of the material's toxicity is its Threshold Limit Value (TLV), which is established by the American Conference of Governmental Industrial Hygienists (ACGIH). The TLV of a substance is the airborne concentration of a substance to which nearly all workers can be exposed repeatedly day after day without adverse effects. TLVs are expressed as parts of the substance per million parts of air (ppm) or as milligrams of the substance per cubic meter of air (mg/m3), averaged over an 8-hour day. For example, the TLV of xylene is 100 ppm or 434 mg/m3. For substances that are highly irritating, highly toxic, or that have immediate effects, Short Term Exposure Limits (STEL) are also used. The STEL of a substance is the allowable average concentration measured over a 15 minute interval. For example, while the TLV for xylene is 100 ppm, its STEL is 150 ppm. This means that the average concentration of xylene over an 8-hour period should not exceed 100 ppm, and that during any 15 minute period should not exceed an average of 150 ppm. Sometimes a TLV has a C assigned to it, indicating the TLV is a ceiling concentration which must not be exceeded at any time. Generally, substances with TLVs at or below 100 ppm are considered highly toxic. Between 100 ppm and 500 ppm is considered moderately toxic, and above 500 ppm, slightly toxic. Remember that TLVs are advisory, and should just be used as a guide for further evaluation of chemicals in your materials. In contrast to the voluntary TLVs, the Occupational Safety and Health Administration (OSHA) has set Permissible Exposure Limits (PELs), which are similar in definition to TLVs, but are mandatory and enforceable. Most PELs are similar to the 1988 TLVs. Table 1 lists TLVs of common solvents, unless the PEL for a particular solvent is lower. The National Institute for Occupational Safety and Health (NIOSH) has established Recommended Exposure Limits (RELs) for many chemicals, based on its research. NIOSH RELs are usually lower than either TLVs or PELs. For carcinogens, NIOSH also recommends reducing exposure to the lowest feasible concentrations. Although some solvents are less hazardous than others, all solvents can cause toxic effects. There are no safe organic solvents, only more and less toxic ones. All organic solvents can affect the nervous system, respiratory system, skin, eyes, and internal organs to some degree. Solvents are also implicated in damage to both the male and the female reproductive systems. Table 1 lists the toxic properties of common solvents. Skin Diseases Solvents can damage the skin in three ways: by drying, by irritation, and by sensitization. Solvents can dissolve the skin's natural protective barrier of oils and waxes to cause drying, defatting, cracking, and fissuring of the skin. They can also irritate the skin to cause reddening and inflammation. Most solvents cause these symptoms in people with sufficient exposure. Some solvents are sensitizers, and can cause allergic reactions, for example, turpentine. In addition, many solvents can penetrate the skin, enter the bloodstream, and cause injury to internal organs. Examples of skin-penetrating solvents are dimethyformanide (DMF), glycol ethers, toluene, xylene, and methyl alcohol. Brain and Nervous System Damage The most commonly experienced symptom of solvent vapor inhalation is narcosis (dizziness, light-headedness, irritability, fatigue, headaches, sleepiness, loss of coordination, nausea, etc.). These symptoms are produced by solvent dissolved in the bloodstream acting directly on the brain to depress the central nervous system (CNS). The effect is similar to alcohol intoxication. These effects are usually reversible if exposure to the solvent is discontinued. However, if exposure is high enough, further CNS depression can lead to unconsciousness and death. Solvent-exposed individuals operating machinery are at a higher risk of accidents because of decreased coordination and fatigue. Studies over the last decade have shown that repeated heavy solvent exposure over several years may cause permanent brain damage, called chronic toxic encephalopathy. Symptoms can include memory loss, behavioral changes, emotional lability, confusion, inability to concentrate, neurological and personality changes, and problems with manual dexterity. The solvents implicated in most studies are the chlorinated hydrocarbons, aromatic hydrocarbons, and aliphatic hydrocarbons (see chart). Repeated exposure to some solvents can also temporarily damage the peripheral nervous system (PNS), which is the system of nerves leading from the spinal cord to the rest of the body. Symptoms include numbness and tingling sensations, difficulty in grasping objects, loss of ankle reflexes, weakness, and in severe cases, paralysis of the arms and legs. Methyl butyl ketone (MBK), n-hexane, and carbon disulfide are solvents known to cause this effect. N-hexane is commonly found in spray adhesives, spray fixatives, rubber cements and rubber cement thinners, contact adhesives, some lacquer thinners, cleaning and sanitizing agents, and in low-boiling naphthas. Most organic solvents can irritate the sensitive membranes of the nose, throat, and eyes. Solvent concentrations that cause this irritation may also damage lung tissue. Chemical pneumonia may be caused by very high concentrations of irritating organic solvents; however, such high levels are usually so offensive that exposed individuals cannot tolerate the exposure. More commonly, lower solvent doses are tolerated in the work environment and after years of exposures, may cause chronic bronchitis. Chemical pneumonia can also be caused by aspiration of aliphatic and aromatic hydrocarbons in liquid form into the lungs, for example from vomiting after ingestion of these solvents. Damage to Internal Organs Upon entering the bloodstream, solvents can be transported to and injure specific internal organs and organ systems. This is especially true for the liver and kidneys, since these organs are often damaged during detoxification and elimination of solvents from the body. Chlorinated solvents, such as perchloroethylene and carbon tetrachloride, are especially toxic to the liver and kidneys. Chlorinated solvents, in general, are among the most hazardous solvents, and should be avoided whenever possible. Chlorinated solvents may form a highly toxic gas called phosgene, if heated or if they come in contact with ultraviolet light. The heart and circulatory system are also vulnerable to the toxic effects of solvents. Benzene and many glycol ethers can damage the bone marrow and cause anemia. Benzene can also cause leukemia. Another solvent, methylene chloride, is metabolized into carbon monoxide, which reduces the level of oxygen in the blood. This exposure can cause heart attacks and especially endangers people with pre-existing heart or lung impairment. Methylene chloride also affects the heart by producing arrhythmias (irregular beating) of the heart at high concentrations, which can lead to heart attacks. High concentrations of freons, trichloroethylene, 1,1,1-trichlorethane, toluene and gasoline have also caused arrhythmias resulting in heart attacks. If an individual is susceptible to arrhythmias, then they could be at risk at even lower concentrations than other people. Although rare, fatalities from acute overexposures to some solvents do occur, usually from heart and respiratory failure. One case study of furniture stripping in dip tanks reported two separate fatalities from methylene chloride paint strippers. The victims were without respiratory protection or adequate local exhaust ventilation. The concentration of a chemical necessary to provoke an acute fatality is usually much higher than levels found in normal, everyday exposures. Cancer Certain solvents have been found to cause cancer. Benzene causes cancer, (although the closely related solvent toluene does not). Most chlorinated solvents, for example, are carcinogenic in laboratory animals, and are probable human carcinogens. These include: carbon tetrachloride, chloroform, trichloroethylene, perchloroethylene, and methylene chloride. Other probable human carcinogens are dioxane and dimethylformamide. FIRE HAZARDS Most organic solvents become potential fire hazards when they evaporate, causing a build-up of flammable vapors. The National Fire Protection Association (NFPA) classifies the flammability and combustibility of liquids according to their flash points. The flash point (fp) of a liquid is the lowest temperature at which vapors will form an ignitable mixture in air at the liquid's surface. Class II Flash point: 100-140degrees F (38-60degrees C) Class IIIA Flash point: 140-200degrees F (60-93degrees C) Class IIIB Flash point: at or above 200degrees F (93degrees C) Combustible liquids, such as kerosene, mineral spirits, and cellosolves, with flash points at or above 100degrees F, are divided into Classes II, IIIA, and IIIB. Although any combustible liquid is a fire threat if heated, Class IIIB liquids generally cause little concern as fire hazards because of their high flash points. Not all arts and crafts materials, however, are labeled according to NFPA requirements. The Federal Hazardous Substances Act (FSHA) regulates the flammability labeling of consumer products, including many materials sold in art supply stores, such as paint strippers, thinners, and aerosol sprays. Although we recommend only NFPA flammability definitions for industrial and professional use, it is important to be familiar with both systems. The FSHA flammability definitions are in Table 3. Table 3. FHSA Flammability Definitions Hazard Category Flash point Extremely flammable below 20degrees F (-7degrees C) Flammable 20-80degrees F (-7-27degrees C) Combustible 80-150degrees F (27-66degrees C). Some solvents, such as ethyl ether, are too hazardous to be used or stored safely in ordinary shops or studios. In addition, ethyl ether, isopropyl ether, dioxane, and tetrahydrofuran absorb oxygen from the air to form explosive peroxides. When containers of these solvents containing small amounts of their peroxide residues are heated (for example by storing them near a radiator or in sunlight), they can be explosive. Friction from screwing on the container lids of these solvents has been known to cause explosions when peroxides had formed on the container lip. 1. Compile an inventory of all solvents and solvent-containing materials. Label all containers, even small vials. Obtain Material Safety Data Sheets (MSDS) on all products. 2. Use water-based materials whenever possible. This minimizes inhalation problems. Note that some water-based materials contain small amounts of solvents to dissolve resins. 3. Use the least toxic solvent possible. Substitute safer solvents from the same class whenever possible. For example, use heptane instead of hexane, and ethyl alcohol or isopropyl alcohol instead of methyl alcohol. 4. Avoid breathing vapors. Dilution ventilation may be adequate for exhausting small amounts of solvent. For large amounts of solvents, or highly toxic solvents, use local exhaust ventilation to capture the solvent vapors before they escape into the room (for example, a laboratory hood, slot hood, or window exhaust fan 1-2 feet away at work level). See the CSA's book Ventilation for more information. Cover containers when not in use. 5. Avoid skin contact. Wear suitable gloves whenever work brings skin in contact with solvents. Make sure that the type of glove material is appropriate for solvents used since the permeability of different glove materials varies with the solvent. See CSA's data sheet on Glove Selection for more information. 6. Avoid eye contact. Wear protective goggles when you pour solvents or when an accidental splash is possible. Do not rely on regular eyeglasses for protection. Do not wear contact lenses. In case of eye contact, flush immediately with clean running water for 15 minutes and seek medical attention. A plumbed eyewash fountain should be readily accessible. 7. Wash hands with a mild soap and water after exposure to solvents, and apply a skin moisturizer (avoid those with coloring and fragrance). Never wash hands in solvents. Baby oil or vegetable oils can remove paint from the skin. 8. Use self-closing oily waste cans to hold solvent-soaked rags. These should be emptied daily. 9. Spill control materials, available from safety supply distributors, should be kept on hand for cleaning up spills and residues. Emergency procedures should be drafted in case of a flammable solvent spill of more than a quart of liquid, because of the severe health and fire risks from the evaporating solvent. See the CSA Spill Control data sheet. 10. Whenever possible, try to reuse solvents by allowing solids to settle, and decanting off the liquid. Filter if necessary. 11. Dispose of all waste solvents properly. Solvent wastes should be collected and stored in approved safety disposal cans. Chlorinated solvents must be stored separately from other solvents. Never pour solvents down the drain. If large quantities of waste solvents are generated, a licensed hazardous waste disposal company should be contracted to remove them. In some instances, it may be appropriate to allow very small amounts (less than a pint) of solvent to evaporate inside an explosion- proof laboratory hood, on the roof, or outside, providing that no one is exposed to the solvent vapors. 1. Protect against fire and explosion. Follow all local and federal codes for the use, handling, ventilation, and storage of flammable liquids. Eliminate all ignition sources in the area. Smoking should be strictly prohibited. 2. The workspace should be equipped with a sprinkler system and appropriate fire extinguisher. Class ABC multi-purpose, dry chemical fire extinguishers are generally recommended. Because of the corrosive properties of the dry chemical, a combination of a Class A and a Class BC carbon dioxide fire extinguisher may also be used. 3. A pint or more of a flammable or combustible liquid should be stored in an approved safety can. For dispensing small amounts of liquids (e.g. for cleanup), use plunger cans. 4. Large quantities of flammable and combustible liquids should be kept in approved flammable storage cabinets. Quantities over 60 gallons (including 55-gallon drums), should be stored only in separate outside facilities or in a special storage room. 5. Use hand pumps when dispensing flammable liquids from either 5-gallon and 55-gallon metal drums, rather than tilting to pour. The metal drum should be grounded, and metal receptacles should be bonded to the drum with wire to prevent the buildup of static electricity. 6. Local exhaust ventilation systems handling flammable solvent vapors, and electrical components in areas where flammable vapors may be present, should be fire- and explosion-proof according to the NFPA and National Electrical Code (NEC). In general, solvents are one of the most underrated hazards in art. They are used for a million purposes: to dissolve and mix with oils, resins, varnishes, inks; to remove paint, varnish, lacquers; to clean brushes, tools, silk screens and even hands. As a result, artists are continually being exposed to solvents. Almost all organic solvents are poisonous if swallowed or inhaled in sufficient quantity, and most cause dermatitis after sufficient skin contact. High concentrations of most solvents can cause narcosis (dizziness, nausea, fatigue, loss of coordination, coma, and the like). This can increase the chances for mistakes and accidents. As mentioned earlier, long-term exposure to high concentrations of many solvents can cause brain damage. In particular, aromatic hydrocarbons, aliphatic hydrocarbons and chlorinated hydrocarbons appear to be implicated. Some solvents - for example,benzene (benzol) and carbon tetrachloride - are so toxic that they shouldn't be used. Other solvents - for example, acetone and ethanol (ethyl or grain alcohol)- are reasonably safe. Solvents fall into several classes with similar properties. If one member of a class of solvents is toxic, usually another safer member can be chosen. are generally anaesthetics and irritants of the eyes and upper respiratory tract. In high concentrations, methanol (wood or methyl alcohol) can cause dizziness, intoxication, blurred vision and possible liver and kidney damage. If swallowed, it can cause blindness and even death. Ethanol, available as denatured alcohol containing some methanol, is a safer solvent. Amyl alcohol acts as on the nervous system causing dizziness, nausea, vomiting and double vision. Uses: shellac thinner, paint and varnish remover, lacquer thinners, etc. are among the most dangerous solvents. They may be absorbed through the skin, although their major hazard is by inhalation. In general they are strong narcotics . The most dangerous is benzene (benzol), which causes chronic poisoning from the cumulative effect of exposure to small amounts. Its effects are destruction of bone marrow, leading to a loss of red and white blood cells,and sometimes leukemia. Toluene (toluol) doesn't have the long term chronic effects of benzene on the bone marrow, but may cause liver and kidney damage. Its immediate effects can be more severe then those of benzene if a person is exposed to a high enough concentration. Toluene may also cause adverse reproductive effects. With proper ventilation, however, toluene is a suggested replacement for benzene. Xylene (xylol) is similar to toluene. Styrene is more toxic than toluene or xylene and may cause respiratory irritation, narcosis, liver, kidney and possibly nerve damage. Uses: resin solvent, paint and varnish remover, flourescent dye solvent, common silk screen wash-up, lacquer thinners, aerosol spray cans, etc. like aromatic hydrocarbons, are very hazardous. Some have been used as anaesthetics in the past, but were found to be too toxic. All of them dissolve the fatty layer of the skin and can cause dermatitis. They also cause liover and kidney damage. The drinking of alcohol after exposure to many chlorinated hydrocarbons can make people very sick. One of the most toxic chlorinated hydrocarbons is carbon tetrachloride and it shouldn't be used. It can be absorbed through the skin and exposure to small amounts can cause severe liver and kidney damage. Exposure to larger amounts can cause unconsciousness and death, especially if alcoholic beverages are ingested. Other toxic chlorinated hydrocarbons include tetracloroethane (acetylene tetrachloride), chloroform, ethylene dichloride, perchloroethylene and trichloroethylene. The last four solvents have been shown to cause liver cancer in mice. Methyl chloroform (1,1,1-trichloroethane) appears to be less toxic than other chlorinated hydrocarbons at low concentrations, but has caused many fatalities when inhaled at high concentrations (for example, "glue sniffing" or working in enclosed spaces). Methylene chloride (dichloromethane) is highly volatile and high concentrations may cause narcosis, lung irritation, pulmonary edema, and is a probable human carcinogen. Methylene chloride also decomposes in the body to form carbon monoxide and inhalation of large amounts has resulted in fatal heart attacks. People with heart problems and smokers are particularly at high risk. Although most of the chlorinated hydrocarbons are not flammable, they may decompose in the presence of ultraviolet light or excess heat (e.g., a lit cigarette) to form the poison gas phosgene. In general try to replace chlorinated hydrocarbons with less toxic solvents. Uses: wax, oil, resin, grease and plastics solvent, paint strippers. also called petroleum distillates, tend to be less toxic than most other solvents. They have a mild narcotic effect and can cause lung irritation in large amounts. If ingested, they may cause pulmonary edema (chemical pneumonia) and possible death due to aspiration into the lungs. Petroleum distillates are also skin irritants. n-Hexane, one of the most volatile petroleum distillates, may cause peripheral neuropathy - nerve inflammation and possible paralysis of arms and legs - from chronic inhalation of large amounts. These symptoms will disappear after a couple of years, but sometimes, with very high exposures, permanent damage to the central nervous system can result. Hexane is found in "extremely flammable" rubber cements and their thinners, in some aerosol spray adhesives and other aerosol spray products,and in low-boiling naphtha (petroleum ether). In recent years, hexane has been replaced by the less toxic heptane in many products. Other petroleum distillates in increasing order of boiling point are gasoline, benzine (VM&P Naphtha), mineral spirits (odorless paint thinner, turpentine substitutes, white spirits) and kerosene. Normal mineral spirits has about 15-20% aromatic hydrocarbons. Odorless mineral spirits and turpenoid have these more toxic aromatic hydrocarbons removed, and are recommended as substitutes for regular mineral spirits and turpentine. Uses: paint thinners, rubber cement thinners, silk screen poster inks, clean-up solvent, and similar products. ESTERS are eye, nose and throat irritants and have anesthetic effects. Most common acetates are not skin irritants or sensitizers. Ethyl acetate is the least toxic, followed by methyl and amyl acetates. They have good odor warning properties. Uses: lacquer, resin and plastics solvent. recently have been found to be much more toxic than previously thought. Methyl cellosolve (ethylene glycol monomethyl ether) and butyl cellosolve (ethylene glycol monobutyl ether) were known to cause anemia and kidney damage. Cellosolve (ethylene glycol monoethyl ether) and its acetate were considered less toxic. Animal and human studies, however, show that cellosolve, methyl cellosolve, and their acetates can cause birth defects, miscarriages, testicular atrophy and sterility at low levels. All glycol ethers need study to determine if they also cause adverse reproductive effects. Uses: photoresists, color photography, lacquer thinners, paints,aerosol sprays. is a common oil paint and varnish thinner. Turpentines from many sources are skin irritants and sensitizers for many people, and can be absorbed through the skin. Their vapors are irritating to the eyes, nose and throat upon prolonged exposure, and some turpentines may cause severe kidney damage. Resulting symptoms includeheadaches, gastritis, anxiety and mental confusion. Turpentine is highly poisonous by ingestion, with one tablespoon possibly being fatal to a child. (d-limonene) have been touted as non-toxic. they are definitely less hazardous by ingestion than most other solvents, although they have a citrus-like odor that has caused children to drink them when they have been carelessly left around. They can still make a child sick, but are less likely to cuase fatalities. there have been some rpeorts of skin, eye and respiratory irritation from their use. - excerpted from Health Hazards Manual for Artists, 4th ed., Lyons and Burford, New York NY (1994).